This journey started with a mold in Gainesville, Florida at the Mirage Manufacturing Inc. ( http://www.mirage-mfg.com/ ) where the Great Harbour Trawlers are built. Our boat is the N-37 model, hull number 49. Bulkheads are set in place and glassed into the hull , the hull is ready to be removed (popped) from the mold. Note the running gear is completely protected. The boat will sit upright if grounded with rudders or wheels in contact. 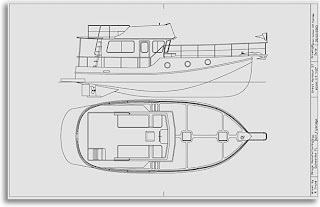 This twin engine arrangement and displacement hull configuration permits a shallow draft with true with engine/running gear redundancy.